This is one of my most favorite Sizzix boxes, box #2. I've used it so many times and in different ways. I cut out an oval shape using a Spellbinders nestie petite oval die. I just got this new punch from the store called daisy chain. It's so cute! By the way, it's on sale this week along with all the other new punches. Bunny stamp and eggs are from Dandelion Designs. Coloring was fast since the stamps are small. I filled the box with M & M's and tied a ribbon on the top. I'm going to be at MunchKins in Mililani Town Center this Saturday doing a make & take from 10-12 pm. Hope to see you out there! Thanks for stopping by today and have a great Monday!!! Another cute project!! 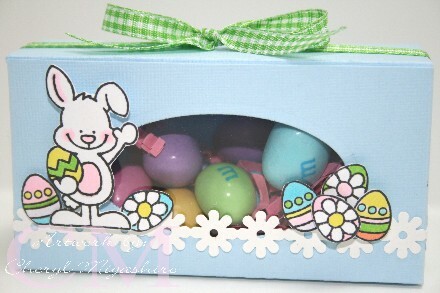 Love that soft blue color, and the cute bunny & colorful eggs. Wising you a very Happy Easter! such wonderful ideas you come up with for those boxes! thanks...so I can CASE you...lol! love the bunny and eggs. this is perfect for Easter! have a good day! This is so cute! Love the bunny! Love your #2 box...especially that daisy chain...ooh, I think I need it!